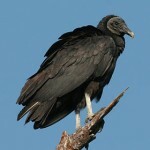 Usually silent, but over coveted animal carcasses groups of vultures may hiss, flop or fight. Description: Sexes similar. Adult uniformly dark brown with small, red, unfeathered head; white tipped bill. In flight, wings held in shallow V; pale gray primaries contrast with dark wing linings and body, giving wings two-toned appearance; tail narrow and fairly long, extending beyond feet. Immature similar to adult, but with dark head and bill. 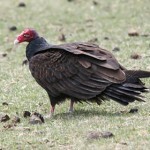 Food: Feeds on carrion and locates by sight and smell. Habitat: Open plains, sandhills or areas offering visual foraging. Cliffs, crevices, abandoned buildings or other cavities are used for nesting sites. Where in Nebraska: Common regular spring and fall migrant throughout the entire state and locally uncommon regular breeder statewide. Hypothetical in winter. Field Notes: At night, groups of a few up to 100 roost together in trees and then leave in late morning when thermals develop. 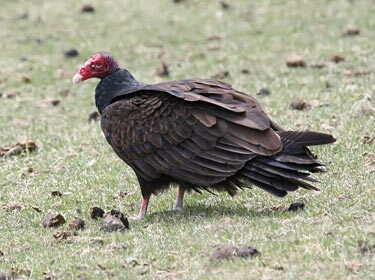 Fun Facts: The Turkey Vulture will defecate on its own legs using the water in the feces help cool itself down.